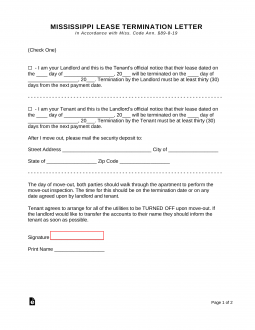 The Mississippi Lease Termination Letter Form | 30-Day Notice is a valuable tool any Landlord and Tenant who regularly enters At-Will Tenancies in the State of Mississippi should keep handy and at his/her disposal. This document form serves the purpose of enabling an individual terminating an At-Will Tenancy in remaining compliant with Mississippi Code Title 89 Chapter 8-19 by providing the framework for a termination letter. In many cases, this may also help in keeping the act of terminating on an official level rather than a personal level. This can be very important as it is generally recommended to end such agreements on a positive note. It is worth mentioning that while this form letter was devised to give Month-to-Month the required 30 days’ notice it will also satisfy the state requirements for terminating a Week-to-Week Tenancies. In the State of Mississippi, a Week-to-Week Tenancy may be terminated with only one week’s notice prior to the termination date. Obviously giving more than a week’s notice in such an arrangement would be considered to be a favorable action for the remaining party. By giving one month’s notice the party terminating the agreement will aid the party remaining to find a replacement while potentially avoiding extraneous hardships. Keep in mind the 30 Days’ Notice requirement will only be fulfilled if the recipient has this letter in their hand a full thirty days before the desired termination date. Step 1 – Indicate if you are a Landlord terminating the Month-to-Month Lease of if you are a Tenant terminating a Month-to-Month Lease. If you are a Landlord, place a checkmark in the box next to the first paragraph and proceed to step two. If you are a Tenant, skip the first paragraph and place a checkmark in the box next to the second paragraph then proceed to step two. Step 2 – In the paragraph you have checked, indicate the Date of the Lease being terminated by entering the Calendar Date, Month, and Year in the first three blank spaces of this paragraph. Then in the next three blank spaces of this paragraph, enter the desired Date of Termination (Day, Month, Year). If you are the Landlord, skip Step 3 and proceed to Step 4. If you are a Tenant, proceed to Step 3. Step 3 – If you are the Tenant, locate the statement starting with the words “After I move out,” then enter the Street Address, City, State, and Zip Code where the Landlord should send your security deposit on the appropriately labeled blank spaces. Step 4 – Sign and print your name in the space provided at the bottom of this document.